Impressive musical clarity, tonal flexibility, satisfying bottom end from our 10" custom speaker and smooth and crisp highs from the 1" voice coil tweeter of the Markacoustic AC 101H —now with a new brown cool look— make it the ideal amp for a wide range of acoustic instruments, from acoustic guitar to acoustic bass, harp, cello, accordion, etc. The AC 101H includes all the features that acoustic musicians need: 48V phantom power for use with condenser microphones, etc., feedback control and phase reverse to easily manage feedback problems and capture the true essence of your acoustic sound while also providing you with serious headroom, pre/post EQ switch for the XLR DI, FX send/return, tuner out and a next generation of digital reverb and chorus, sweet sounding, warm and natural. Markacoustic amps/combos are manufactured to be sold and used in the country of purchase, and they are factory preset to that country’s voltage. 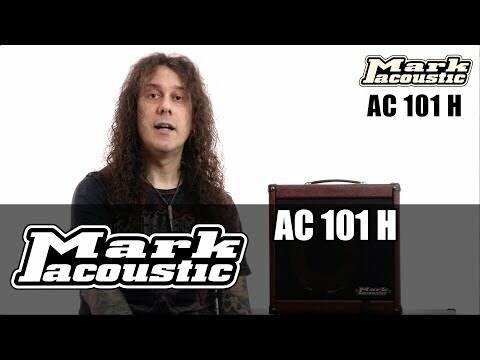 Fingerpicking.net reviews the AC 101H. March 13, 2018, 3:22 p.m.